We’ve been talking a lot lately about how quickly and dramatically consumer behavior is evolving. In today’s world, customers expect flawless treatment – if they don’t get it, they’ll bring their future business elsewhere, which is more possible than ever because the internet has shrunk our world. With all this in mind, any organization’s Knowledge Base is one of the most essential elements in providing effective service to its customers. After all, imagine if your customer service reps (CSRs) don’t have the most current information and knowledge to help your customers – the results can be catastrophic. In today’s blog, we’ll be discussing how Dynamics 365’s Knowledge Article versioning can help ensure that you avoid such a catastrophe. The amount of knowledge a CSR acquires or requires varies during each customer interaction involving creating a case, resolving an issue, or providing an update. Knowledge Articles play a critical role in ensuring the availability of a repository of products/services features, FAQs, product details, etc. However, outdated Knowledge Articles create a huge risk, as CSRs rely on all information being accurate. And a repository that is not kept current means CSRs don’t have access to the latest information on new product features or resolutions for newly-reported issues by customers. Thus, it is essential to regularly update Knowledge Articles, which is achieved by utilizing the Article Versioning feature in the Dynamics 365 Customer Service Hub. 1. Navigate to Customer Service Hub > Service > Knowledge Articles > Create and manage article versions. 2. Note in the screenshot below that this article is on Major Version Number 1 and Minor Version Number 0. From here we can select either Create major version or Create minor version. An example of a major version is if the you’re updating the Knowledge Article with the details of a new feature or functionality; a minor version is appropriate if, for example, there is a small change in the user interface with no change to functionality. 3. 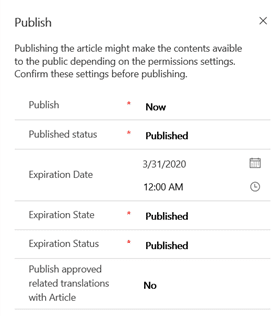 In our example, we’ll click on Create minor version, thus creating a new version of the article that contains all information – including permissions – from the previous version. Note that Minor Version Number now indicates 1. 4. Review the article and make any necessary changes to the title, keywords, and description of this new version. 5. Once updated, follow your standard Knowledge Article workflow process for approval. If you don’t have a strong process in place, consider using PowerApproval. 6. Once reviewed and ready to be published, click … > Publish, as shown below. That’s it! Users now have access to the latest and greatest information. With these simple steps, one can effectively keep Knowledge Articles current and manage the versions of each change in Dynamics 365 Customer Service Hub.